Posted on October 24, 2014 at 12:00 pm. 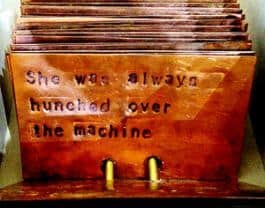 From The Watcher Files: "She had her own reason for participating," a poem stamped on 3x5 copper cards. PORTLAND, ORE.— Artists Garrick Imatani & Kaia Sand have been in residence at the City of Portland Archives and Records Center (PARC) since 2013, and will present their selections from the work they have produced at a special exhibit at the North Portland Library, 512 N Killingworth Street from October 27 – December 5. The public is invited to attend a free opening reception on October 27th from 5:30 to 7:30 p.m. with light refreshments and a performance that will begin at 6:00 p.m.
Where is anonymity within a public document? Surveillance creates a bright threat of attention on private lives. But how is this attention blurred? How might someone’s identity masquerade inside these files? Imatani explored the paradox of anonymity within public documents through photography and graphite drawings housed in a sculptural cabinet inscribed with language. Sand’s exploration took the form of poems embroidered into black textile panels. This exhibition will travel to Portland State University in January 2015.